We have spent the past several weeks discussing why residents of Dallas, Texas need a will (now!) and the various ways that having a will helps you. No one likes to think about dying, and there are always more pressing issues that seem to need attention first. Here is a quick review of the reasons that you need to move creating a will to the front of your to do list. A will outlines your assets as well as how you would like for them to be divided among your heirs. Some divisions are simple and some are insanely complex, but sorting your assets out in advance will reduce strife within your family in the event of your death. If you die intestate (without a will), then the great state of Texas will use a predetermined set of standards to divide your assets for you. The only guarantee in that scenario is that the state won’t know your wishes as well as you do. There is a common misconception that your dividing your assets in a will can lead to shock or surprise and fighting amongst your heirs. 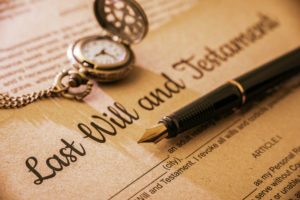 It’s true that some wills are shocking, but for the most part having a thorough will helps your heirs to understand that you had a well thought out plan and they will respect your wishes. A detailed, well written will can save your family a lot of time, money and emotion because it leaves very little to fight over. One of the most vital things a will can do is to address the care of your minor children. You can use a will to designate a guardian and a backup guardian. Part of making a will is coming to these decisions with your spouse and asking the people that you have chosen if they will play that role. In addition to a guardian for your minor children, this is the time to establish a testamentary trust so that your children will be provided for financially. It’s easy to say that the kids get the money, but it takes a bit more planning than handling the thirteen year old the ATM card. You will name a trustee to oversee your children’s finances at this time. People often put off creating a will because they don’t want to spend the money to hire a good attorney to create a will. While it does cost money, it saves a lot more in the long run. It is far less expensive to have a will drafted in Dallas, TX than it is to probate an intestate estate. The average savings on a very simple estate is about $3,000. It is also crucial to larger estates that proper estate planning is utilized to minimize or eliminate certain taxes. This concludes out introductory series on why Dallas, Texas residents should create a will sooner rather than later. If you require assistance with the drafting of a will then contact our office to speak with a lawyer. In addition to Dallas, our probate attorneys service the Highland Park, University Park, Plano, Denton, Fort Worth, and McKinney, Texas areas.